betel leaves recipes. Betel leaves are leaves of the betel plant that are bright green in color. They are mostly cultivated in south-east Asia and India. They vary in types – Calcutta, Banarasi etc and in shades of green. The leaves are edible and mostly used to make after meal snacks called paans. Also, betel leaves hold a religious significance in the Indian culture. These leaves are used for the peppery taste. The most common dish made with betel leaves is Paan. Contrary to popular belief, paan is not only had in India, but consumed in other countries as well like Indonesia, Myanmar and Malaysia. Paan is basically a betel leaf stuffed with a betel nut, chunna and other ingredients. It is mostly consumed for its psychoactive effects, the most common variant being Meetha Paan. The unique flavor of paan can be brought out in many innovative ways. It can be turned into a delicious Paan ice-cream, which is simple and all ingredients are also easily available at the nearest Paan shop! An excellent way to impress your guests is making Paan shots. These tiny shots made are made with ice cream, betel leaves and gulkand, have the taste of paan but just with a twist on how to eat them. 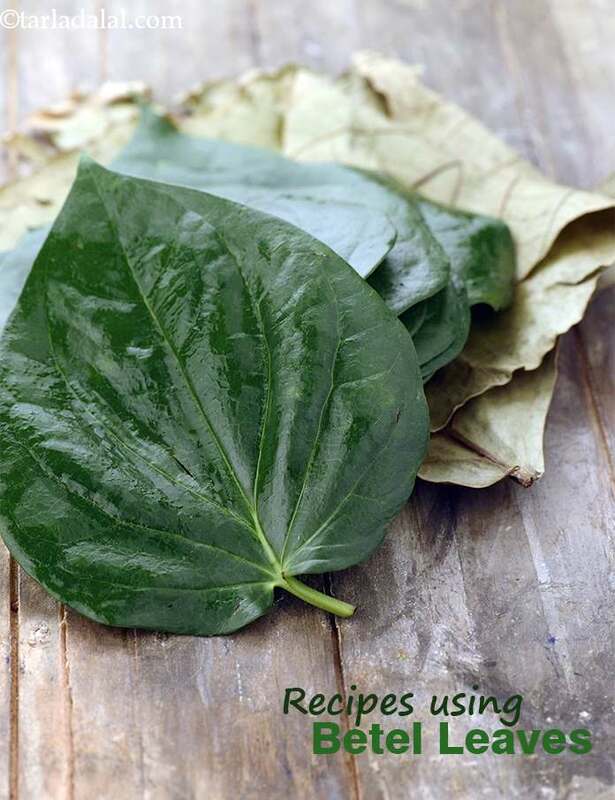 Enjoy our betel leaves recipes given below. This Healthy green drink is sure to liven up your spirits and bring a cooling refreshing twist to your daily life.The coriander, mint and spinach are blended together and then savoured with raw mangoes and black salt as seasioning. This can be used as mouth freshener and also can be used as a sweet.